and has since grown into a small corporation doing business all over Florida. incredible talent for seeing and thinking out of the box. We are fully licensed and insured. We are available for emergencies if needed within 24 hours for an additional rate and fee. Payments are due upon receipt and all jobs are performed on a first come first serve basis (appointment only). Priority is given to the job at hand. Appointments may be altered or changed at a moment. If appointment is altered, we will accommodate you with the next available time. ESTIMATES ARE FREE IF DECISION FOR WORK TO BE PERFORMED IS GIVEN WITHIN 3 BUSINESS DAYS. If no decision is rendered, a $95.00 fee will be charged. These are based prices given and may vary depending on circumstances not visible; WE ARE NOT to be held liable for other contractors hired, shipping delays, nor assume risk on other services/others required; You hereby hold Marine One Services, Inc. harmless in all such respects & instances other than gross negligence. 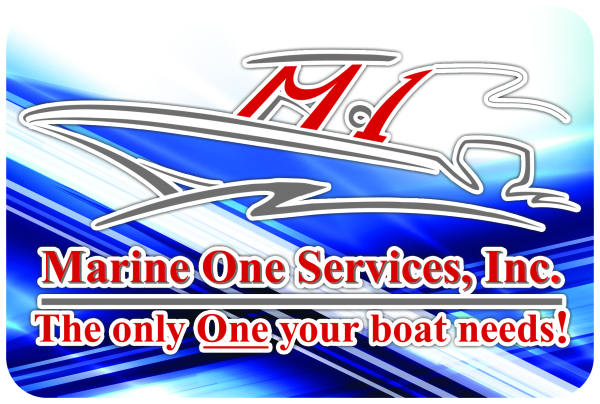 We are also not responsible for any damage for hauling your boat in and out. We reserve the right to terminate jobs for any non-payment &/or negligence on customer's part. All EMERGENCY/NOT SCHEDULED OR RUSH JOBS ARE SUBJECT TO A HIGHER RATE OF $237.50. RETURNS are liable for re-stock of 15%. All parts will be ordered upon Deposit & due 48 hours of agreed/signed estimate. The final payment will be submitted upon completion/receipt. A Credit card must be on file & will be charged if payment is not received within 5 business days of completion. All jobs are subject to weather. Sea-trials are not included. 15 Day LATE FEE of 15% of the total on balances. 2.9% Convenience Fee on the total balance if using a Credit Card; Non-Registered guests will be charged storage after 3rd day of completed work. NSF Fee - $35.00. Payment(s) confirms you have read & agreed to the receipt. Sea-trials, warranties, etc. will not be validated until final payment is remitted. We have a 10 days warranty on our work that starts the date of completion on new parts installation and no warranty on USED parts or LABOR ONLY. Warranties are made by manufacturer & assumes nor authorizes any other person or any liability in connection with said sale products; Returns must be made within 5 business days of purchase date & subject to a 20% re-stock fee/shipping cost; NO REFUNDS ON ELECTRICAL, SPECIAL ORDERS AND/OR USED PARTS.